I recently decided to upgrade my Two Little Fishies Phosban 150 Reactor with something larger; so I went ahead and purchased a new Vertex UF-15 Universal Media Reactor. Although this is the smaller of Vertex's two new media reactors (the UF-20 being the larger), it is considerably larger than the Phosban 150. The UF-15 is a relatively new product, and so I thought I'd offer my thoughts on it. The basic design of the UF-15 is similar to the Phosban 150 and in fact most other reverse-flow media reactors on the market. Water is pushed to the bottom of the cylinder via a centrally placed pipe and allowed to flow up through the media before exiting the reactor body. 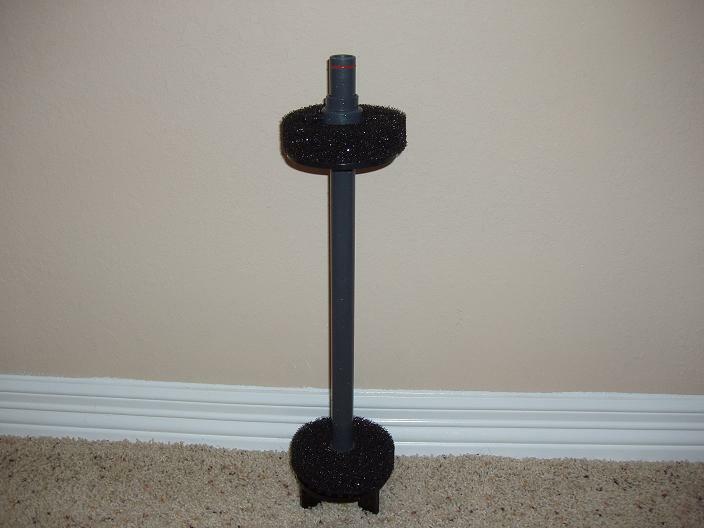 This helps prevent the media compaction commonly associated with down-flow reactors, where the pressure of the water pushes the media down and, with the help of gravity, compacts it. Two strainers prevent any debris from entering the reactor and any media from leaving the reactor. 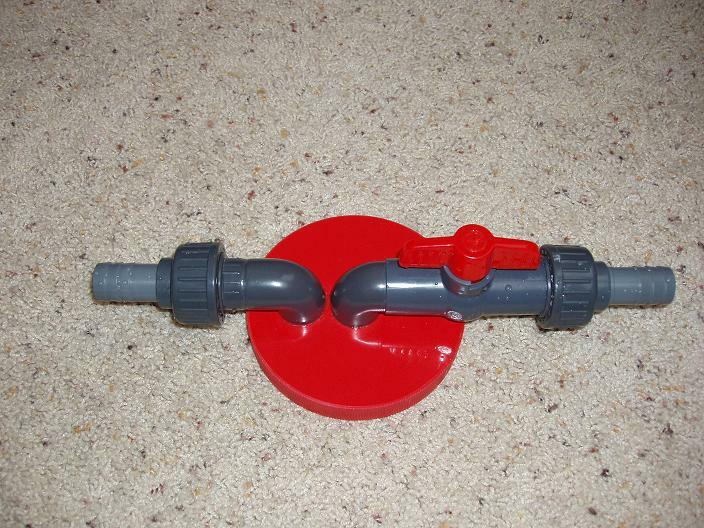 Additionally, a valve is placed on the water inlet pipe to help acheive an optimal water flow rate through the media. 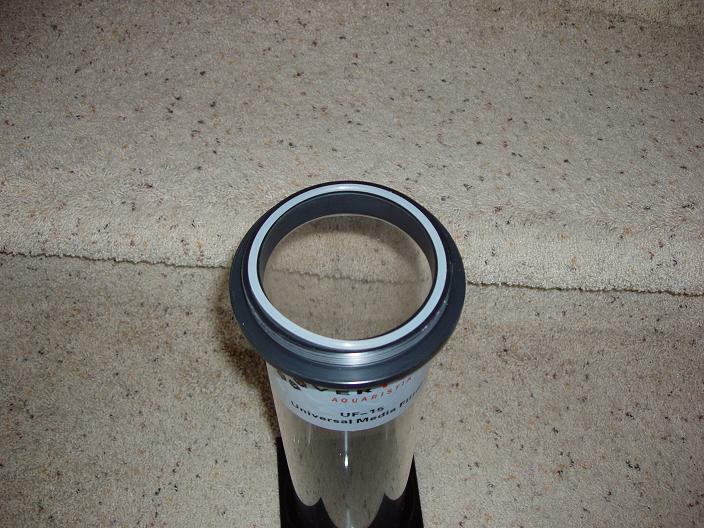 The Vertex UF-15's beefy O-Ring. The top cap of the UF-15 is much more solidly plumbed, reducing the chances of leakage even with considerable back-pressure. The elbows, unions, and barbed fittings are all welded on. This is as opposed to the flexible rubber fittings on the Phosban 150, which tended to leak for me if I had the outlet tube go all the way up to the display tank (too much back-pressure). Additionally, the UF-15 includes quick disconnects in the form of unions both on the inlet and outlet sides of the reactor. This makes removing the reactor to change media easier. Another thing I like about the UF-15 is that the barb fittings are the standard type with three barbs each. The Phosban 150, on the other hand, utilizes the well-known Two Little Fishies single-barbed fittings. I can't really say for sure whether three barbs actually provides any real advantage at the pressures we use, but they certainly feel more solid. Not that my Phosban 150 ever leaked at either barb-fitting. One issue that I have with the UF-15 is that the barb fittings are 3/4" rather than 1/2". Most individuals will probably be feeding this reactor with a Marineland Maxijet, so that is something worth considering. I chose to purchase two reducing barb adapters rather than re-do the rest of my plumbing. The top cap of the UF-15 with welded fittings. Note the ball-valve and unions. Another area where the Vertex unit stands out is the design of the inner assembly. 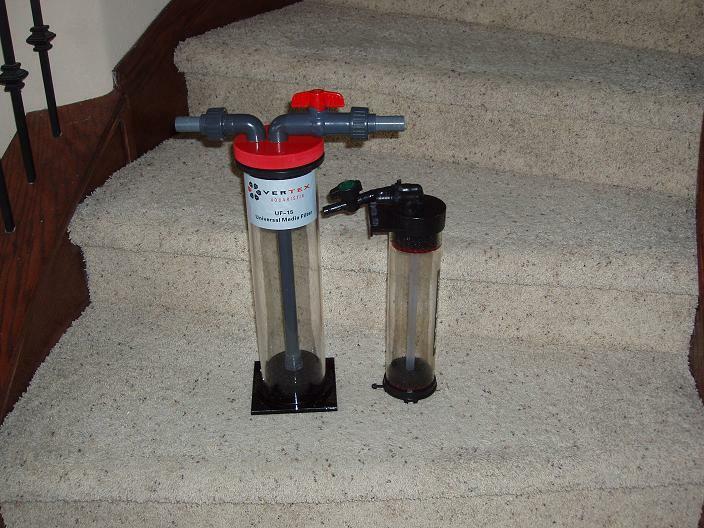 The sponge filters are about 1" thick (compared to 1/4" thick on the Phosban 150) and the top strainer is adjustable. That is, it can be moved up and down the tube. A plastic screw is used to tighten it in place. Additionally, the top of the water inlet pipe has a rubber ring around it, insuring a tight fit with the top cap. Indeed, because my unit is placed above my sump when I turn off the feed pump and hold the outlet above water the unit actually siphons out all the water into the sump. This makes changing out the media easier. The inner assembly of the UF-15 with adjustable top-strainer. I'm very satisfied with the design and the quality of construction of the UF-15. My only complaint regarding quality is that one of the barbed fittings I originally received leaked. The barb fitting is actually inserted directly into one end of the union and it seems the manufacturer forgot to glue it in. However, I had some PVC Cement and it was easy enough to glue it myself. One thing to keep in mind is that the UF-15 cannot be mounted on the side of the tank like the Phosban 150. It lacks the Phosban 150's top assembly that allows it to rest on the tank lip. Additionally, the base plate would get in the way. The base plate is neccessary, however, to keep the unit from falling over when placed upright. 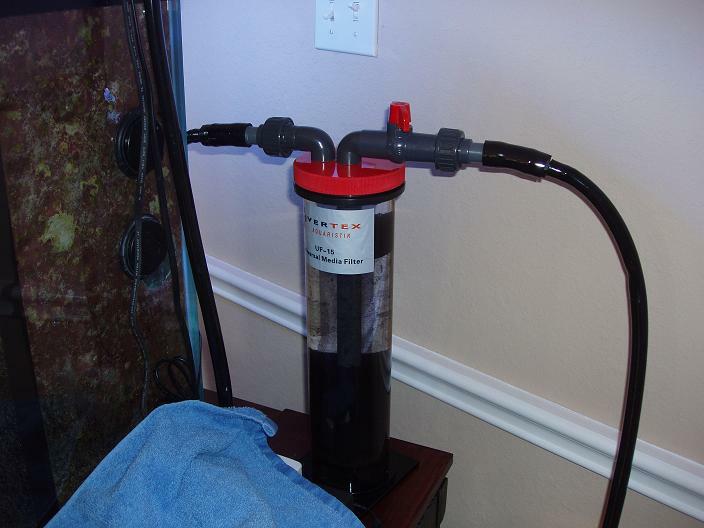 The UF-15 set up and running with activated carbon on my system. A final caveat is the price. The going price of $110 is a little steep. Especially with the Phosban 150 going for $40 at most retailers. If you can find a good deal of the UF-15 (I got mine on sale for $80), it helps make it more competitive. After a couple of months of use I noticed that the black plastic strainers that, in addition to the sponge material, prevent any media from leaving the reactor seemed to have expanded slightly. This made them difficult to insert or remove from the body of the reactor. I solved the problem by sanding them for just about three minutes each on a sheet of 100-grit sand-paper. After that, I was able to slide them in and out of the reactor body smoothly again.